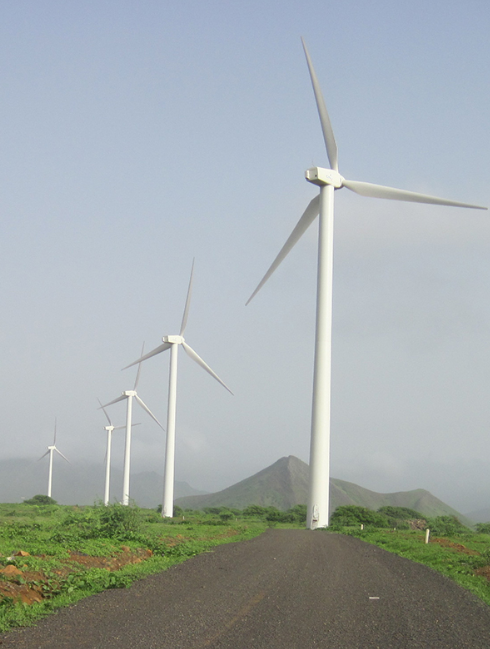 The Cabeólica Wind Project comprises four small, separate wind parks on four of Cabo Verde's nine inhabited islands. The parks have a combined generation capacity of 25.5 MW and were commissioned between December 2011 and July 2012. The Investment cost of the Cabeólica wind project (4 wind parks) was approx. 60.9 million €. The Santiago wind farm is located in the southern region of the island, on Monte de São Filipe, on the outskirts of the city of Praia. This wind farm occupies some 30 hectares of land and contains 11 wind turbines, which corresponds to an installed capacity of 9.35 MW.